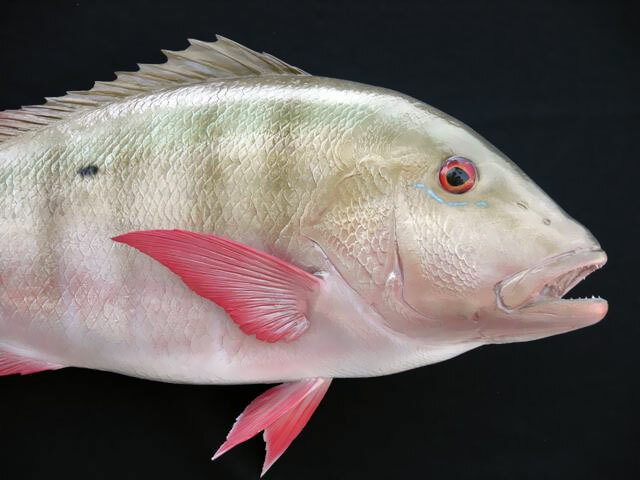 The mutton snapper, Lutjanus analis, is a species of snapper native to the Atlantic coastal waters of the Americas from Massachusetts to southern Brazil, including the Caribbean Sea and the Gulf of Mexico. They are particularly common in the Caribbean. They inhabit reef environments, with adults found in areas with rock or coral, while juveniles occur in sandy habitats with plentiful weed growth. They can be found at depths of from 82 to 295 ft (25 to 90 m), though most often between 130 and 230 ft (40 to 70m). They have olive-tinted backs and red sides with a black spot between the lateral line and the dorsal fin and blue stripes on the head. This species can reach a length of 37 in (94 cm), though most do not exceed 20 in (50 cm). The greatest known weight recorded for this species is 34 lb (15.6 kg). This is a commercially important species and is also sought-after as a game fish. It can also be found in the aquarium trade. 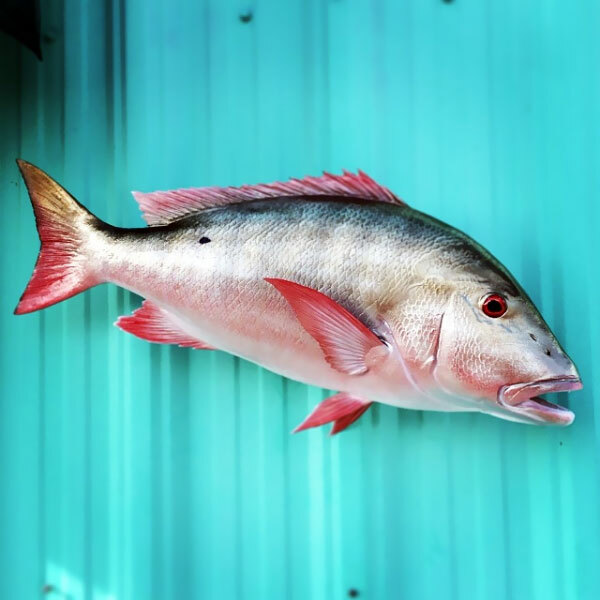 Mutton snapper are a highly prized fish by saltwater anglers; they can be caught on a variety of baits, but are most commonly caught on live or frozen shrimp, whole or cut squid, minnows, and smaller bait fish (such as live or dead pinfish). 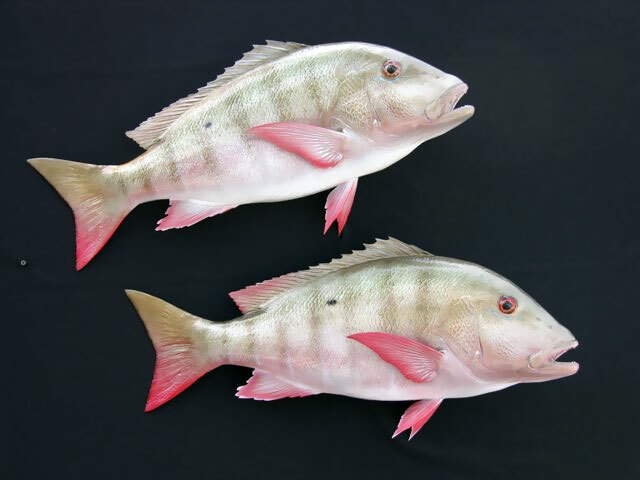 Mutton snapper have been caught on artificial baits, but seem to prefer live bait. They can generally be found in deeper water, although catches (generally of juveniles and smaller fish) are not uncommon in more shallow water. They are also caught on the surface during night-fishing expeditions. Mutton snapper are typically known as great fighters relative to other snapper species, so are harder to land on lighter tackle. Many are often landed as a bycatch of anglers targeting other species of snapper or grouper. 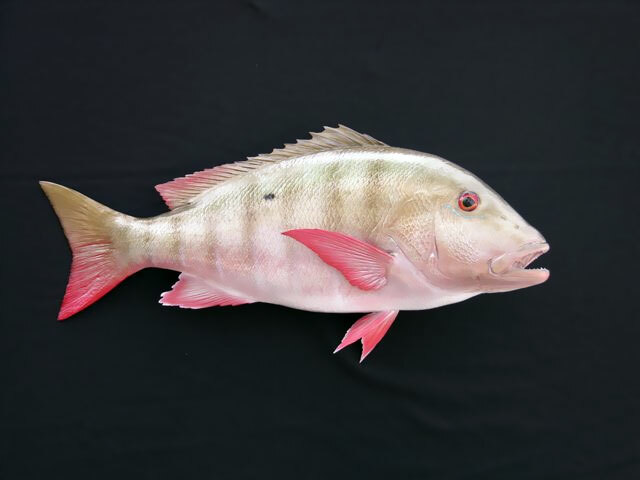 Mutton snapper, especially adults, tend to be solitary, but can be seen in smaller schools. Their flesh is considered by most as excellent table fare. Like most of the snapper family, the meat is white, flaky, and light, and is excellent prepared in a variety of ways.